These are very popular territorials. Some can be extremely rare and worth tens of thousands of dollars. Many more are available for a few thousand dollars each. 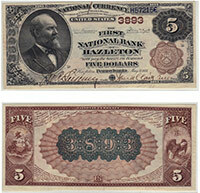 The collector value really just depends on the condition and issuing bank. We have handled lots of notes like this and we would be happy to let you know what yours is worth. Don't forget to check the serial number. Number 1 notes always sell for nice premiums.